About 1.6 million Kawasaki-branded power tool batteries distributed by Alltrade Tools LLC are being recalled. The battery packs can overheat and melt during charging, or fracture during use and expel plastic shards, posing burn, laceration, and bruise hazards to consumers. Alltrade Tools LLC has received 30 reports of incidents, including eight injuries from the battery packs melting, or fracturing and expelling plastic shards while in use. Injuries include minor acid burns from handling fractured battery packs, cuts, bruises and some temporary hearing loss from a loud noise that can occur if an internal battery cell ruptures. The recalled batteries are used to supply power to drills and other power tools. They were sold both with tool combination sets and individual power tools. 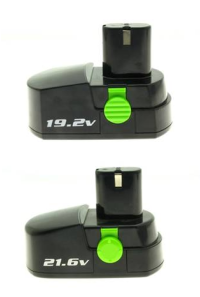 The recall includes 19.2 and 21.6 volt NiCad battery packs. The battery model number is located on a label on the bottom of the battery pack. The power tools model number is stamped onto the inside lid of the tool sets plastic carrying case. The batteries were sold by National wholesale club retailers nationwide from September 2005 through September 2007 for between $40 and $100. They were made in China. Consumers should stop using the recalled battery packs immediately and contact Alltrade Tools LLC to determine if they have the recalled batteries. The company will provide a free replacement battery pack for consumers with recalled batteries. Alltrade Tools LLC is directly contacting consumers who purchased the power tools containing recalled batteries. Consumers should not return batteries or drills to the store where purchased. Consumer Contact: For additional information, contact Alltrade Tools LLC toll free at (877) 231-9239 between 9 a.m. and 5:30 p.m. ET Monday through Friday.